Pines are a large and important genus of conifers in the family Pinaceae. The Plant List of the Royal Botanic Gardens, Kew and Missouri Botanical Garden lists 126 species of pines, plus some synonyms. 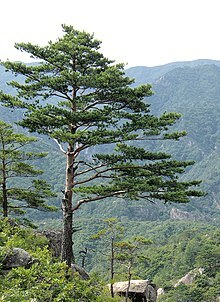 Pines live in almost the entire Northern Hemisphere. In North America, they live in the southern part of Arctic to Nicaragua and Hispaniola. In Europe, they live in areas from Portugal and Scotland to Russia. In Asia, they live in areas from Russia to Japan and the Philippines. They also live in the Himalayas, some northern parts of Africa, and north of Majorca (Mallorca) on the rugged mountains. Pines are long-lived, typically reaching ages of 100–1,000 years, some even more. The longest-lived is the Great Basin bristlecone pine, Pinus longaeva. One individual of this species, dubbed Methuselah, is one of the world's oldest living organisms at around 4,600 years old. This tree can be found in the White Mountains of California. Pines usually have male and female cones on the same tree (monoecious). The male cones are small, typically 1–5 cm long, and are only present for a short period, usually in spring. They fall as soon as they have shed their pollen. The female cones take 1.5–3 years (depending on species) to mature after pollination, with actual fertilization delayed by one year. At maturity, the female cones are 3–60 cm long. Each cone has numerous spirally arranged scales, with two seeds on each fertile scale; the scales at the base and tip of the cone are small and sterile, without seeds. The seeds are mostly small and winged, and are wind-dispersed. Some are bird-dispersed. At maturity, the cones usually open to release the seeds, but in some of the bird-dispersed species (e.g. whitebark pine), the seeds are only released by the bird breaking the cones open. In others, the seeds are stored in closed ("serotinous") cones for many years until an environmental cue triggers the cones to open, releasing the seeds. The most common form of serotiny is pyriscence, in which a resin binds the cones shut until melted by a forest fire. ↑ "The Plant List Version 1.1". Retrieved 15 December 2015. ↑ Ryan, Michael; David M. Richardson (1999). "The complete pine". BioScience 49 (12): 1023-1024. This page was last changed on 24 February 2019, at 13:16.